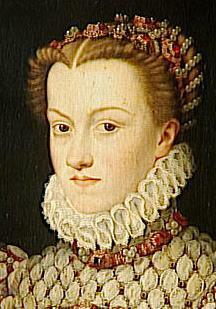 (1541-1587) was the son of Cosimo I de’ Medici and Eleonora de’ Medici. His education included instruction in science and the decorative arts, and these were to remain his abiding interests. 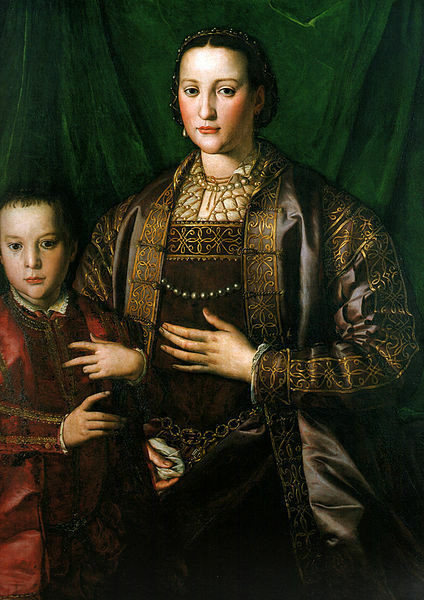 Bronzino painted a portrait of Eleonora with Francesco. 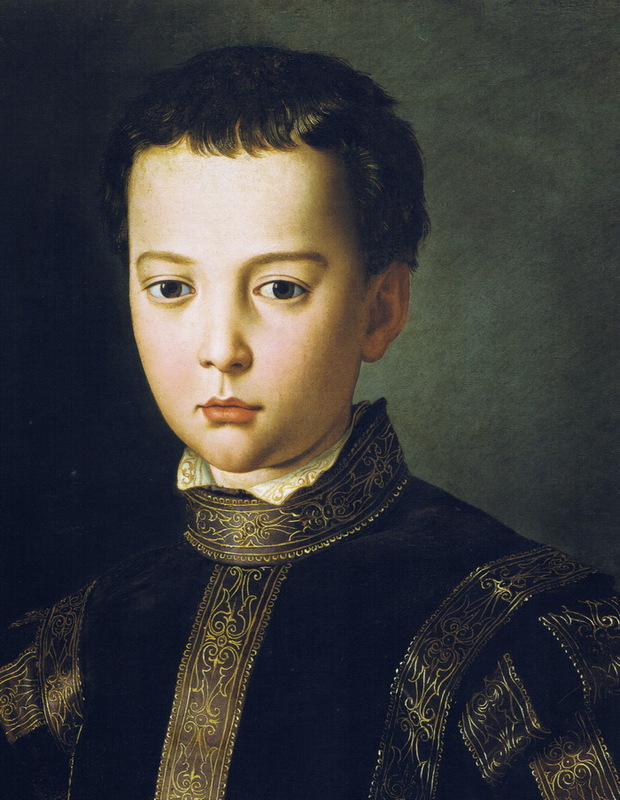 He was again painted by Bronzino in 1551, the first of a series of quadretti of Cosimo’s children at the same age (photos bellow). 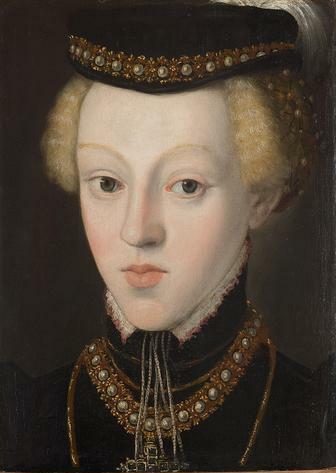 The last image of his youth was the idealized portrait by Bronzino’s pupil Alessandro Allori, of Francesco with a miniature of his sister Lucrezia. In the 1550s Francesco became interested in the art of Giambologna and from 1561 paid him a monthly salary. The Prince’s first major commission to the sculptor was for Samson Slaying a Philistine; it marked the beginning of a long patronage. In 1564 Francesco was made Prince Regent, and celebratory medals were struck, the first of many by Pastorino dei Pastorini and Domenico Poggini. At about the same time Poggini carved a marble portrait bust of Francesco de’ Medici which, in contrast to Benvenuto Cellini’s tensely realistic portrayal of Cosimo de’ Medici, presents a generic and romanticized image, the forerunner of the idealized rulers of the Baroque. In 1565 Francesco travelled to Vienna and Innsbruck and returned with the promise of an imperial bride. 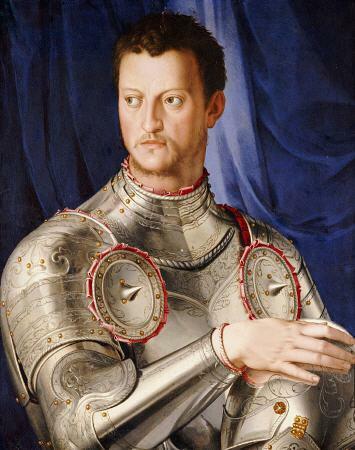 One result of this trip was a full-length portrait, probably by Allori, showing Francesco standing in armor in the Habsburg manner. The other was the ceremonial arrival in Florence in December 1565 of Joanna of Austria (photo on the right), daughter of the Holy Roman Emperor Ferdinand I; the wedding, celebrated over several weeks, was intended to mark the full grandeur of the new Tuscan state. Some of its lavish features still survive, such as Giorgio Vasari’s redecoration of the courtyard of the Palazzo Vecchio, Francesco’s residence, with gilded stuccoes on the columns and frescoes of Austrian cities on the inner walls. 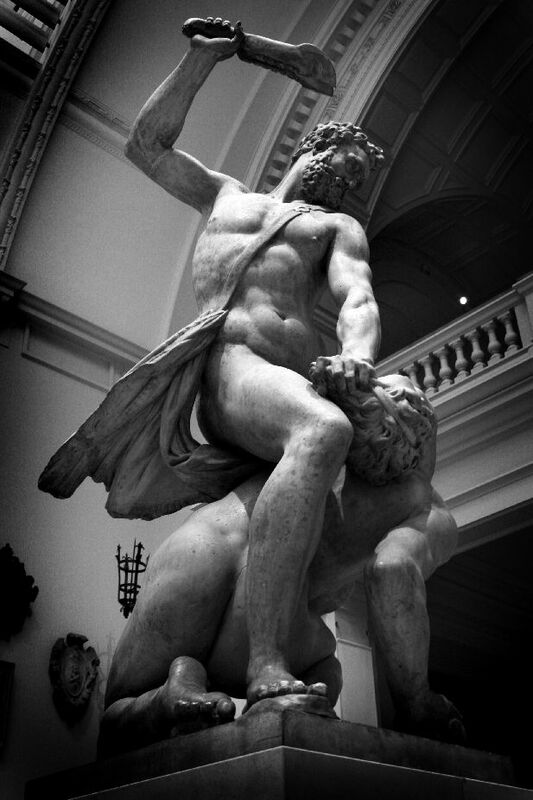 Also associated with these celebrations is Giambologna’s marble group Florence Triumphant over Pisa. In the Palazzo Vecchio, Vasari also built Francesco a private apartment, consisting of a bedchamber, a secret closet and a small, richly decorated treasure-room, connected by a hidden stairway to his famous studiolo. The decoration of the studiolo displays, in an arcane program devised by Vincenzo Borghini, the range of Francesco’s interests, expressed in terms of man’s dominance of nature through art and science and illustrated by scenes and figures symbolic of the Four Elements and the Four Seasons and their presiding gods. The scheme, under Vasari’s direction, combined frescoes, oil paintings, mosaics and bronze statuettes in an elaborately varied exhibition, on a tiny scale, of the finest examples of Florentine Late Mannerism, employing, besides Vasari himself, the talents of Giambologna, Bartolommeo Ammannati, Francesco Poppi,Giovan Battista Naldini and others. Francesco appears as a spectator in such scenes as Giovanni Maria Butteri’s Glassblower’s Workshop and Alessandro Fei’s Goldsmith’s Workshop, and, more remarkably, as the protagonist in Joannes Stradanus’s The Alchemists. There was indeed a private laboratory in the Palazzo Vecchio, built earlier by Vasari for Cosimo I, in which Francesco was reputed to experiment in alchemy and chemistry, metalwork and crystal-cutting, and developments in the manufacture of fireworks, paste jewelry and porcelain. He certainly encouraged his favored artist, in the last, and in 1572 he brought Ambrogio and Stefano Caroni from Milan to Florence, followed in 1575 by Giorgio Gaffurri, to set up a workshop specializing in hardstone products. These un-princely activities were unpopular with the Florentines, who were only too aware that Francesco’s ten-year apprenticeship had failed to remake him in Cosimo’s heroic self-image. 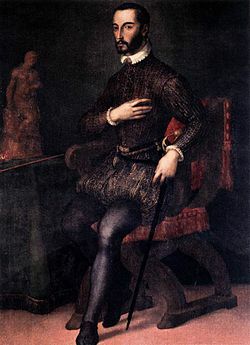 His accession in 1574 was marked by disparaging assessments by diplomatic observers, describing his short stature, melancholy mien, graceless bearing and taciturn circumspection. 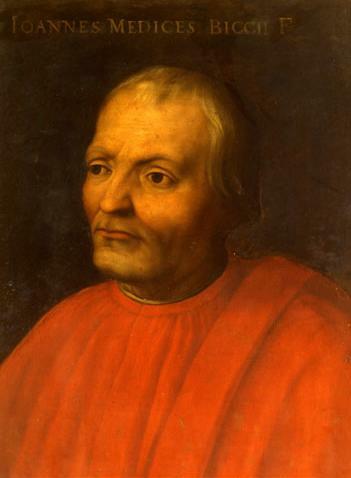 His preference for his various private pursuits over public duties was also noted; these included his notorious affair with the Venetian beauty Bianca Capello, who had become his mistress in 1568. It was for Bianca that Buontalenti created the second masterpiece of Francesco’s patronage, the Villa Medici at Pratolino, near Florence. 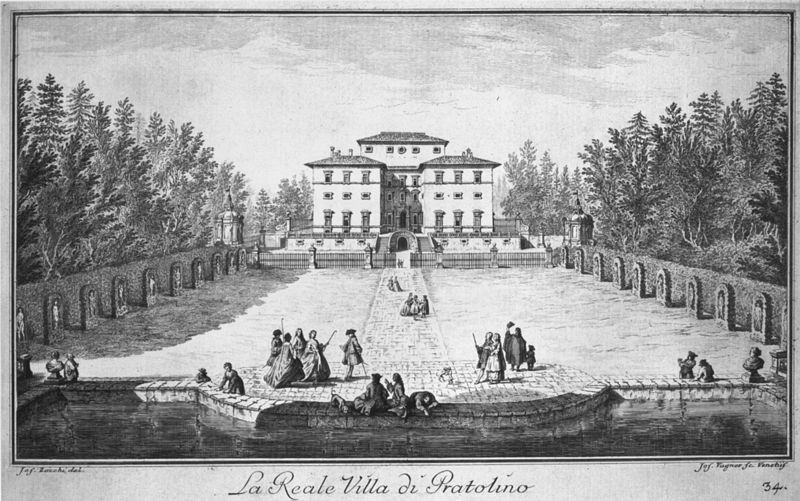 The main building was on the traditional lines of the Villa Medici at Poggio a Caiano. Buontalenti’s inventive artistry was concentrated on the amazing gardens, with their terraces, grottoes, fountains, set-pieces and automata. Most of these were completed by 1581, when Montaigne visited and described them in his Journal de voyage en Italie par la Suisse et l’Allemagne, and were still functioning a century later. Virtually all that remains at Pratolino is the gigantic fountain-figure of the Appennines (1580), created by Giambologna. 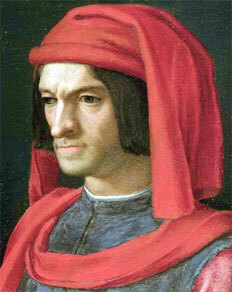 Francesco appointed Buontalenti as his court artist after Vasari’s death in the year of his accession. One of his earliest duties was to arrange the celebrations of the birth of Francesco’s heir, Filippo, in 1577. Also being celebrated was the Emperor’s belated approval of the title of Grand Duke of Tuscany, originally granted to Cosimo I by Pope Pius V in 1570. In 1578 the death of Joanna of Austria was commemorated in elaborate obsequies; less than two months later Francesco secretly married Bianca. Their union was officially celebrated the following year with the most lavish festivities yet seen in Florence. Bianca’s new status was recorded in a number of portraits by Allori, depicting her with both the Grand Prince Filippo and her own older, illegitimate son Antonio. 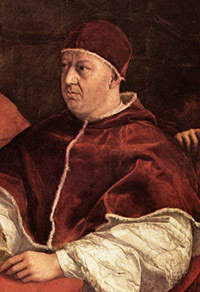 After Filippo’s death in 1582, Antonio was legitimized. Perhaps to emphasize the continuity of his line, Francesco commissioned in 1584–1585 a series of paintings of his ancestors, known as the Serie Aulica, from various minor artists; a hieratic double portrait of his late wife and son by Giovanni Bizzelli (1556–1612) was added to it in 1586. He himself was portrayed with rather more effective dignity by Hans von Aachen, wearing the Order of the Golden Fleece conferred on him in 1585. 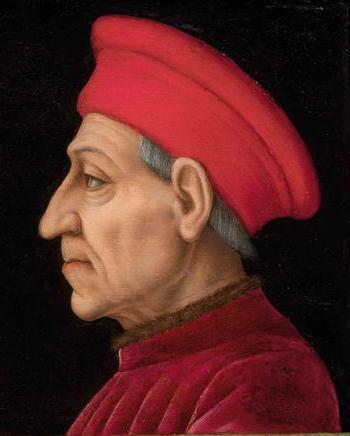 Francesco’s extravagance, and his second wife and son, were deeply resented by his subjects; however, he did much to improve the cultural life of Florence. In 1583 he founded the Accademia della Crusca (‘chaff’) for the purification of the Italian language and the promotion of Tuscan literature. He had already encouraged those decorative arts he loved by grouping craft workshops, particularly those producing jewelry, glass and porcelain, in Buontalenti’s Casino de’ Medici in Piazza S Marco; he even moved his own laboratory there. 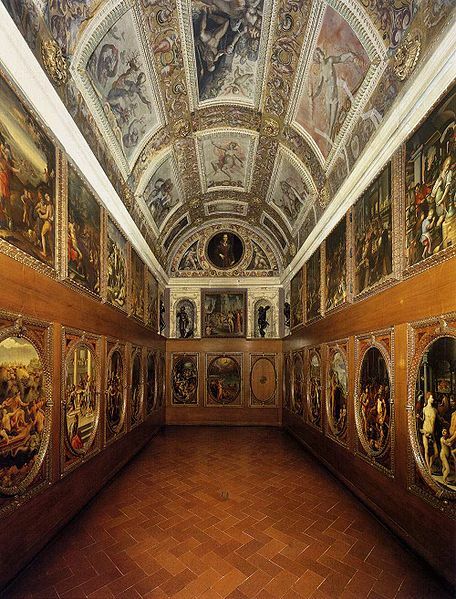 In 1581 he ordered the transformation of the upper storey of the Uffizi, newly completed by Buontalenti and Alfonso Parigi, into an art gallery to display his collections, with the choicest pieces grouped in Buontalenti’s octagonal, domed Tribuna. In the centre of the latter was placed a tempietto decorated with gold reliefs by Giambologna, five of which showed Francesco supervising building projects: the fortifications of Livorno and of Portoferraio, the villa at Pratolino, the Forte di Belvedere and the façade of Florence Cathedral. In fact, Pratolino was the only one completed by Francesco, and, of the others, only the work at Livorno was begun by him. The competition for the façade of the cathedral was held in 1587, and the various models for it survive. But this, like the other projects, was interrupted by the sudden death from malaria, one day apart, of both Francesco and his wife.